If you read my last post, while I was waiting for my bagel dough to rest and rise, I decided that instead of relaxing or cleaning up, I would make fresh pasta. I mean, I already had the flour out, and I had some eggs in the fridge, why not? Just for future reference, I recommend not hand-kneading pasta dough and bagel dough all in the same day. Get yourself a Kitchenaid if you are going to get ambitious. Trust me on this, your arms will thank you. To me there is almost nothing as comforting as fresh, homemade pasta. After thanksgiving each year, I pretty much make my mom use the turkey carcass to make stock, whip up some fresh egg noodles, and make the best turkey noodle soup I have ever had. I have made fettuccine, tortellini, and ravioli. 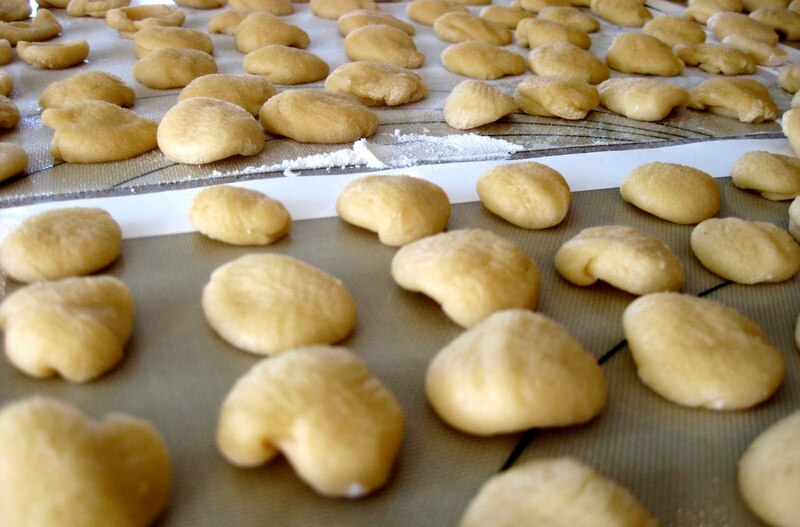 Now since I don't have a pasta rolling machine, I decided to give my rolling pin a break for the day and make something a bit easier on the biceps: Orecchiette, or Little Ears. These were fun to make, almost therapeutic even, squishing and twisting each little teeny ball of dough out over a kitchen towel until I had a little army of ears sitting to dry on my kitchen counter. Getting ready for me to boil them up and toss them with some fresh pesto and parmigiano reggiano cheese. You can mix the dough together by hand, but I cheat and start it in my food processor. Place all ingredients into food processor and, using the dough blade, pulse until it forms a ball (or comes close, mine never really forms a complete ball, there is always some stragglers). Turn dough out onto counter on a floured surface and form into mound. If it is too dry, you can add a few drops of water and work it in to the dough until it is holding together, but not sticky. Knead the dough for about 10 minutes until it becomes pliable, working in flour if it becomes tacky. 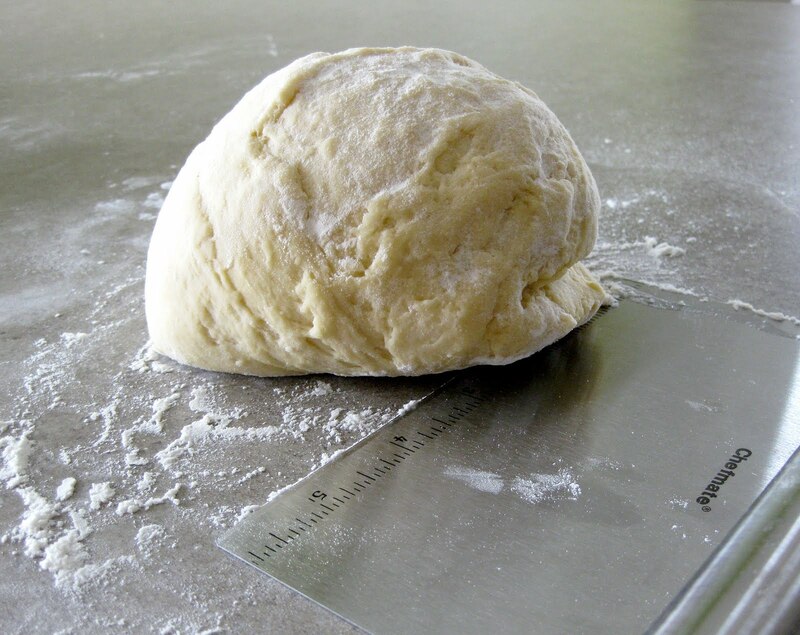 When dough is smooth, either wrap in plastic wrap or put underneath an inverted bowl for one hour. This will let the gluten relax and make it easier to shape your pasta. At this point you can do whatever you want with this dough. 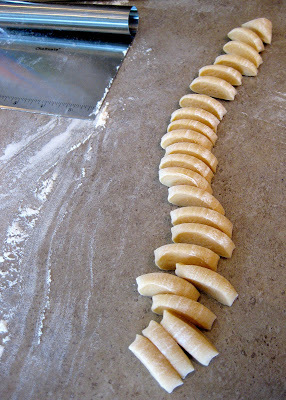 You can roll it into sheets you make lasagna or fettuccine, or roll out little circles to make tortellinis. This is a good basic dough for making any type of pasta. I however chose to make the little ears. Once the dough is fully rested, cut into 4 equal parts. Start with one of the quarters and wrap the rest in plastic wrap until you are ready to use them. Roll out the dough into a long log shape (think back to when you were a kid and used to make worms and snakes out of play dough, it'll help) until it is about 1/2-3/4 inch thickness. Cut this log into a million little pieces (okay maybe not a million but it sure felt like it) with a pastry cutter or knife. They should be about 1/4 inch wide. Cut them smaller than you think you should, the pasta plumps when you cook it (yes, just like ball park franks) and if you make them too big, you will have more dumpling, than pasta. Which for you, may or may not be a bad thing. Lay out a slightly damp clean kitchen towel at your work space. I remember hearing somewhere that orecchiette is suppose to have the texture of a cat's tongue, meaning it is supposed to be rough one one side. 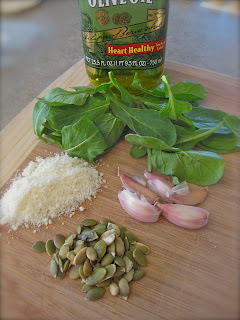 This helps sauce adhere to the pasta, and gives it a very unique characteristic. I have no clue if this is actually true or not. I didn't have the time to wiki-it. Except use a towel, it will be easier and you will get the cat tongue texture. Once you have your shape, lay them in a single layer and let them dry for at least an hour before cooking or freezing them. I am sure I am not the first one to come up with this combination, but I didn't use a recipe.The peppery, slightly bitter arugula paired nicely with the salty nutty pepitas, but the combinations are endless when it comes to pesto. 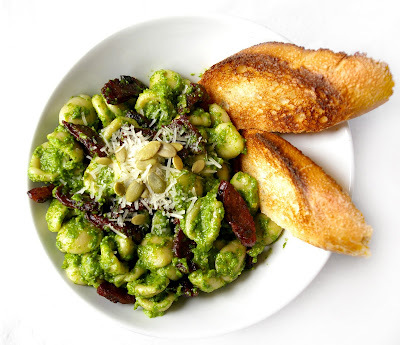 Try experimenting with different greens and nuts, its one of my favorite base sauces to play with. 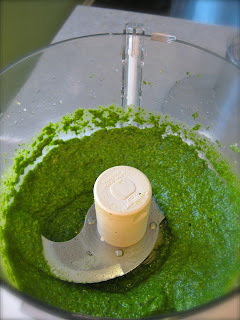 Place garlic in food processor and pulse a few times until minced. 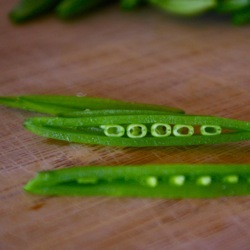 Add pepitas, arugula, salt and pepper, and process until a paste forms (about 30 seconds). Stream in olive oil until paste thins out and you achieve your desired consistency (this will probably be anywhere form 1/2 cup to 1 cup of olive oil). Add parmesan cheese and pulse a few times to combine. Leave at room temperature until ready to use. Bring a large pot of salted water to boil, throw in your ears, I mean pasta, and cook 3-5 minutes, possible more depending on how not-so-itty-bitty your orecchiette turned out. 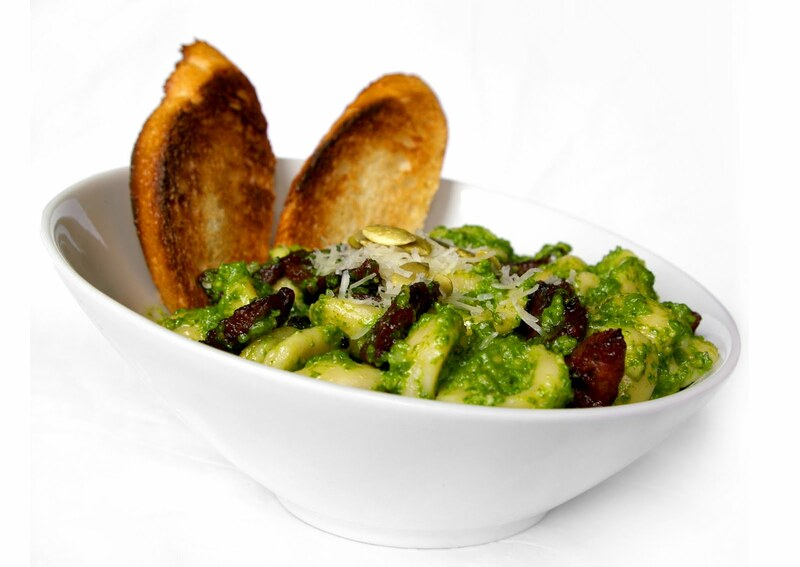 Taste testing is the best answer for deciding when pasta is done, plus its like appetizers without the hassle. 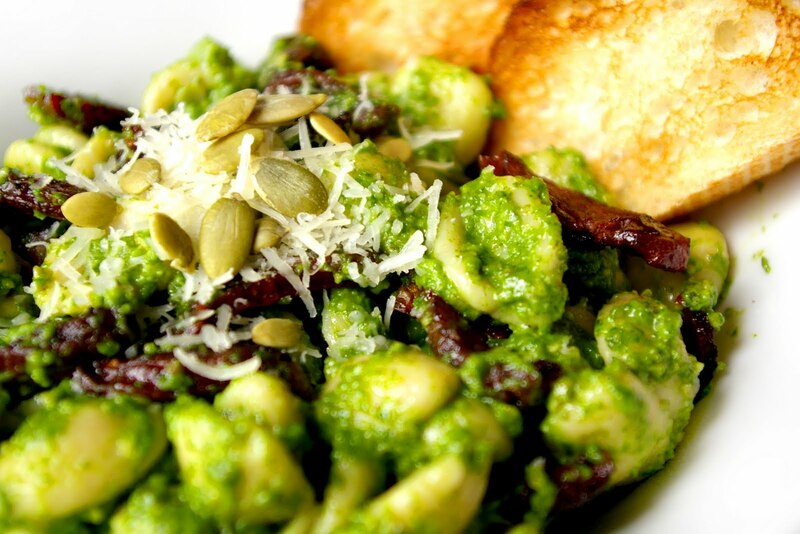 Drain, and toss with pesto to coat. I also had some leftover chicken basil sausage that I threw in as well, but grilled chicken, or shrimp would be a delicious addition as well. I had a ton of pasta and pesto leftover, which I froze separately to be used later. And by later, I mean the next day. Bon appetito! Wow, what a great post! Looks like your little ears turned out perfectly. ok, I am offically in need of a Bria dinner! all this stuff looks/sounds so delicious! Hungry Dog- Thanks, they were pretty tasty! I am a fan of your blog as well, its on my daily blog rounds, thanks for stopping by. 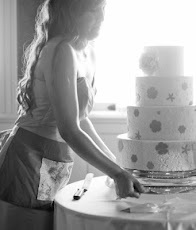 Katie- yes we should make a plan to cook again together soon! 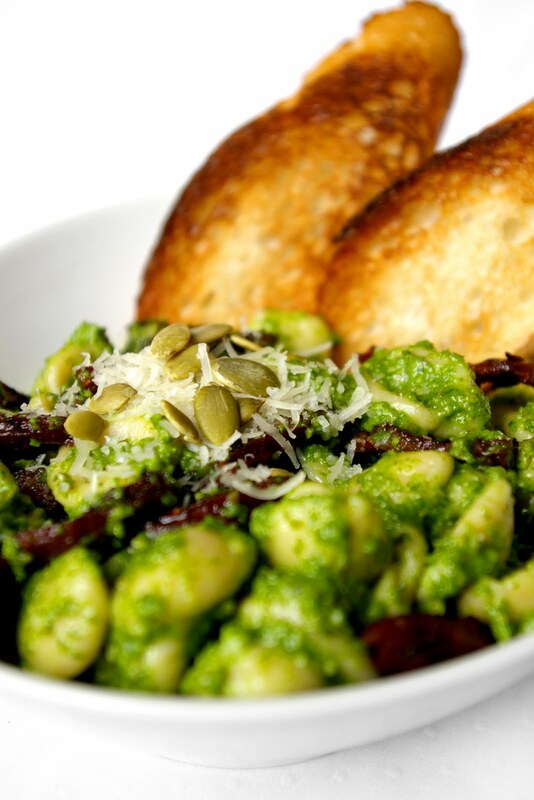 There is definitely an endless amount of pasta recipe combinations out there. I find the higher the egg to flour ratio, the richer the pasta. You can also get a really rich pasta by only using egg yolks, which I have seen Mario Batali do. Your mission seems much more successful than mine. Haha, I read your post, and I thought it looked pretty good. Happy Birthday America, have some bagels.